It has been a long wait but it is finally out. You don't have it? Well, go out and get it. This is one of the most amazing stoner-space rock adventure LPs (double on multicolor vinyl 250, 250 black vinyl) of the year. The band have been playing some of these numbers for a few years live. The CD begins with a funky space rocker called "Galactic Racetrack". Amazing bass and drums on this track. Next up is "Carefree", a rerecorded version from what was released on the Care for Dominance 7" (with a great version of "Dominance And Submission" by Blue Oyster Cult!). The title track, "Dinosaur Futurobic" is next and an almost ZZ TOP like boogie number, with a great freaked out ending. "Organic Room" and "Cosmic Bound" slows things down and the band enter into a very stoned groove and layer in bit of psychedila as well. Very HEAVY songs... wow... "Toothgottago" tells a story about a bad tooth and is probably the fastest song the band has ever played. Breakneck... Great guitars on this one. A WE style mid-paced heavy rocker called "Jinxed" is next and is a real catchy number. I love the slide guitar on this one and great chorus ("People flying high up in the sky"). "Antidote" is a fantastic funky number with some great layers of slide, funky 70's wah guitar, and then the band slowly glides out into space. "(Still got the) Hats Off" is a hard song for me to describe. It has a catchy melodic chorus followed up by a gritty distorted guitar riff. A pretty psychedelic number. The title track of their From The Spaceways 10" from a few years back is next and is a great slow grooving space rock number. Takes you out to a distant planet with its slow and very heavy groove. Amazingly cool guitars on this song as well. The CD ends with the bands dedication to Black Sabbath and the soul of rock and roll, which was born back in 1971... Amazingly heavy song and a great way to end the CD. 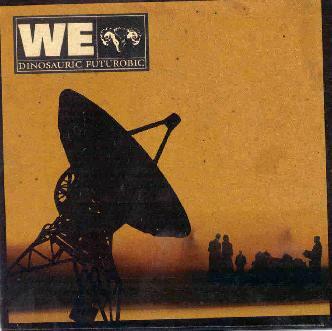 Congratulations to WE for showing the world how to make a perfect mix of stoned psychedelic elements, heavy, yet tuneful melodies and just damn great songs. There is a lot of stuff to listen for in the WE music. Search it out, find it, discover a new reality. For more information you can visit the WE web site at: http://www.we.org.